Has anyone else played the new Giddings bass piece? Just curious to see if anyone else has played the new v-max that Giddings has put out? Re: Has anyone else played the new Giddings bass piece? No I haven't played the V-Max but I just switched to the Don Harwood and like it a lot! I had a quick look at their website now. 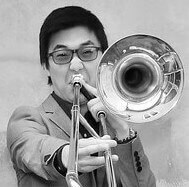 From what I understand the rim diameter is close to 28.5 which is typical for a medium sized bass trombone mouthpiece like the Laskey 85, but the throat seems huge. I would like to hear what people think. I tried the Harwood model and the NY-O (aka Markey) model. Both felt fantastic on the face and were great fun to play but I noticed that the steel did something to my sound that was hard for me to notice while playing but became apparent when I recorded myself. I personally don't like the sound of stainless and I know I'm not alone. I couldn't imagine trying to blend in a section being the only one with a stainless piece. Also I would guess a reason it's not called the Markey is because he doesn't play on it. You guessed wrong. He developed this mouthpiece and played on it quite a while after having played the Don Harwood model while in the NYP. He ultimately switched back to brass, not sure which, and therefore the name of that model changed. I do know he played on steel at some point, but I said he DOESN'T play on it (present tense). What I was implying is that since he does not use it anymore they don't use his name, sorta like the GB Ny series (yes I know the NY is slightly different from the Alessis but you get the point). He plays a GP now just so you know. Exactly. GP meaning G.Pagano, I assume ? I like playing stainless. It gives my sound good clarity. I feel like it gives my sound some presence without having to really push.